The Rangers made a pair of moves today. The first was trading forward Cole Schneider to Nashville for forward Connor Brickley. Brickley, 26, has a line of 7-4-11 in 39 games with Milwaukee this season. Schneider spent a year and a half with Hartford, putting up a line of 29-46-75 in 112 games. This is an AHL depth move, and really nothing more. The Blueshirts have also recalled defenseman Ryan Lindgren from Hartford. 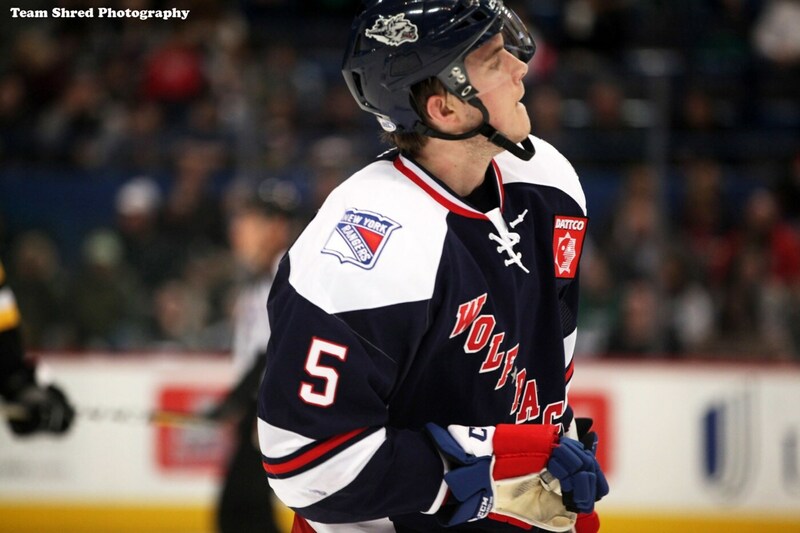 Lindgren, acquired in the Rick Nash deal, has played 35 games with the Pack this year, his first pro season, and has a line of 0-5-5. He’s more known for his defensive prowess and shutdown/physical ability than his scoring. The 20-year-old likely helps shore up an injured blue line. I don’t think this is a move foreshadowing a larger move to come. "Rangers recall Ryan Lindgren; trade Cole Schneider to Nashville", 5 out of 5 based on 1 ratings. When you want to pull the C off a player, dealing them is usually the easiest way to do it. Whose C got pulled? Am I missing something? We don’t even have a C – the last one is in Tampa – actually the last two are in Tampa. Schneider was the captain in Hartford. The kid is hard nosed, I saw him at Hershey and liked what I saw!!!!!!!!!!! I’m looking forward to the trade deadline. It will be tellling what moves are made as to whether or not management are just trying to field a team for revenue or if they are serious about the rebuild. If no moves are made. Quinn is toast. Because it means the mgmt believes he can win with what they already have. And if they don’t improve its on the coaches head. I am underwhelmed with what I have seen of Quinn so far. I was expecting him to be able to squeeze more out of players by this point in the season. His in game adjustments have gotten better , but I still for the life of me from game to game don’t know what system he is running. Sometimes it’s counter attack forchecking , sometimes it’s getting two forwards deep. I think I even saw a variation of the old left wing lock. I have a dream, it’s that New York wins the World Series, the Stanley cup, and the nba championship. With all the young guns on all 3 teams this is a real possibility. I digress. I wonder if the situation in Columbus could open the door for a trade of the King? Columbus can get something for goalie Bob and the Rangers get something, probably pennies on the dollar in terms of return in picks and prospects and would have to retain salary–but both teams get something. Without Henrik the Rangers will tank and easily take over the 31st spot in the standings–and increase their odds at getting Huges. I was reading something about the Rangers possibly going after Auston Matthews as an RFA. So here’s what’s up with that. As of now, the Leafs have around $19mm to extend whom they want out of 10 players before July 1. Unless both Matthews and Marner take team friendly bridge deals, gonna be tough to extend both for an extended period. Since Marner’s agent is dead set on waiting until season’s end, the focus would be to lock in Matthews, but that doesn’t appear to be happening either. Come July 1, they’ll have around the same money available unless they don’t make qualifying offers to all their RFAs, which is a probability with Ozhiganov. The summertime cap space should run up to $29mm for them. If the fringe players take their QO(getting the summer cap down to $26-7mm), there could be a raid on the Leafs not seen since the Viking sagas. I can see a smart team going after Kapanen for $4mm a year and getting him for a 2nd round pick because of Matthews & Marner taking up all the cap space, even with the summer headroom. With a sale in Arizona looming, new ownership might go all in on Matthews for the home town buzz in order to gin up support for a new arena. With Hossa’s LTIR cap credit, they’ll have more than $17mm available to bid. They have a bunch of RFAs of their own, but moving Stepan would clear the decks for that. The Rangers will have $14mm and change available, so they can’t max, but if they dealt Zibanejad they’d have close to $20mm available. It’s a leap of faith to deal him at the draft(or even sooner) but the rule of thumb is this: try to be good, but if it turns the wrong way, then be really bad and hope you get lucky. Half the reason you make the offer is to make Toronto match, causing them all sorts of roster construction problems. Toronto can’t buy out Marleau, he would be doing them a huge favor if he would waive his no trade clause in the off season. I think the keys to cap space are moving Shattenkirk at over 6 million, and what will they do with Hayes. I have no problem moving on from Shatty and even retaining 50% salary to do it. Enough players on ELCs over the next few years to smooth it out. Hayes? Rangers could get a high price for him if Edmonton is really willing to move Puljujarvi. Retain 50% and get them to throw in their 1st rd pick in 2020. Gotta get more lottery tickets for down the line. If Toronto wins the Cup, they will be able to do what they want and the fanbase will be behind them, including letting guys like Marner go. I see them playing out the year and dealing with these issues in the off-season, and them making it work through bonuses and playful accounting. Hopefully the beginning of a new era on defense. This kid is a hard-nosed tough player..
Lindgren called up? Why him? Why not Gilmour? or perhaps no one since there are still activated dmen sitting in street cloths needing minutes and evaluated tradability. Seems like a reach or a publicity stunt for the die-hards. Probably better left to serve time after the trade deadline when there should be a lot more room on the Defense. His point production stinks. Not very impressive. I believe they put Claesson on injured reserve, while both McQuaid and Pionk are day to day. So this is not for show. They needed an extra body. I think Lindgren is a good choice. He was playing top pair alongside Gilmour and is more defensively responsible. Plus, they can call him up for a few days and send him back down during the break without risking a waiver claim. Gilmour is an emergency call up if the Rangers have Shatty & ADA are hurt. Lindgren can play either hand and yknow, defend. Might as well see what we have with him instead of a known quantity like O’Gara.